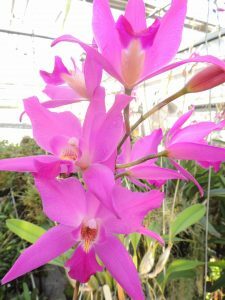 With Orchid Christmas approaching (do come and join us on December 13th 6-9pm) our Cool Americas section is turning pink as the Mexican Laelias come into bloom. The first to flower is Laelia gouliana. This is a strong growing species with large fat pseudobulbs and flower spikes up to 120cm long. Each flower spike is topped by 6 to 12 large pink flowers. The flowers are long lasting and make Christmas with us a very colourful festival. We water plants heavily in the summer when in growth and keep them hung in the roof of the greenhouse where they get good light and dry out quickly after watering. The species was endemic to cool mountain woodland in Hidalgo State, Mexico but is very sadly now extinct in the wild. It is quite common in cultivation suggesting that wild collection was a key factor in its disappearance. There is excellent research published in Lankesteriana in 2007 which looks in detail at the many threats faced by Mexico’s orchid species. The research also gives the date extinct species were last recorded in the wild or when the last section of their habitat was destroyed. This makes depressing reading and highlights the importance of sustainable production of orchids to reduce any demand for wild plants, act as a focus for education, and in some cases facilitate reintroductions. Extinction of Laelia gouldiana in the wild is dated 1998. The plants of Lealia gouldiana in our collection were donated by several different growers, and are therefore likely to be several clones. We will be pollinating plants to produce seed for the future. 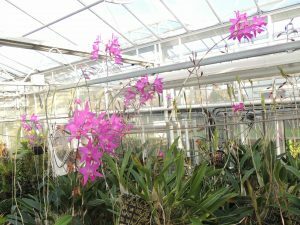 I read the artical on Mexican orchids last night and found it extremely interesting. I had not realised the impact of coffee production on orchids before, the real cost of a cup of coffee!